Halitosis (bad breath) affects men and women of all ages, with social and psychological consequences. 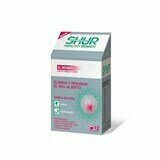 Created by the recognized Ampliphar laboratories, SHUR is the new and total solution for the effective fight against halitosis, which provides a fresh and healthy breath. A solution born from the advance of science and expertise of a renowned laboratory in solving a problem that affects millions of people.